A detailed description of the software capabilities, code samples and a complete API reference. The HiQPdf HTML to PDF Converter can render HTML documents using Web Fonts in formats like Web Open Font Format (WOFF), TrueType or OpenType with TrueType Outlines. The Web Fonts offer a great flexibility to web designers to create special effects on text in a HTML document because they are not limited anymore to a small set of fonts installed on the client computers displaying the HTML document. The Web Fonts are downloaded on the fly by converter and used to render the HTML document to PDF without installing those fonts on the local machine. The location from where the fonts can be downloaded is given in a CSS3 @font-face rule. Using CSS media types in a HTML document you can have one layout for screen, one for print and one for handheld devices. The @media rule allows different style rules for different media in the same style sheet in a HTML document. By default the HTML to PDF converter will render the HTML document for 'screen', but can layout the document for another media type by simply setting a property in your code. The HTML to PDF conversion engine is the most important feature, but the HiQPdf software is a complete PDF Library for .NET. You can create new PDF documents and add text and images at the desired positions in pages in a traditional manner, open and edit external PDF documents by adding new objects, create PDF documents with interactive forms, fill and submit interactive forms, merge and split PDF documents, extract text and images from PDF documents, search text in PDF documents, rasterize PDF pages to images, convert PDF document pages to HTML documents in memory or in files, silently print PDF documents to a printer. The HiQPdf HTML to PDF converter can be configured to convert only a selected region of the HTML document to PDF. Other HTML to PDF converters on the market can only hide the content around the region to be converted, but the HiQPdf converter will precisely convert the selected HTML region as it would be a standalone document. A HTML document can be laid out at any position in PDF using a PdfHtml object and multiple objects of this type can be overlapped in multiple layers which can create a very interesting effect when the HTML documents have transparent background. HiQPdf Library allows you to set the PDF page size, orientation and margins, browser width and height, HTML content location, HTML content fitting and scaling in PDF page. The HTML to PDF converter engine can automatically generate table of contents based on the heading tags of a HTML document. The HTML to PDF converter engine can automatically generate a hierarchy of outlines based on the heading tags of a HTML document. When the 'display: table-header-group' is present in the HTML table thead tag style the thead content will be automatically repeated on all the PDF pages. When the 'display: table-footer-group' is present in the HTML table tfoot tag style the tfoot content will be automatically repeated on all the PDF pages. The HTML to PDF converter engine can automatically generate fillable PDF forms based on the HTML form input controls. 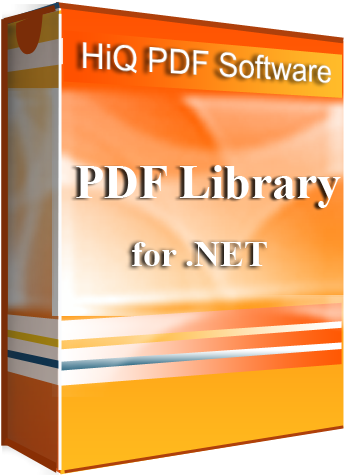 HiQPdf Library allows you to extract the text from PDF documents to .NET String objects. When you extract the text you can choose the extraction mode and the range of PDF pages from where to extract the text. HiQPdf Library allows you to search a text in a PDF document. The search can match the case or whole word only and you can choose the range of PDF pages where to search the text. The library returns the positions and the bounds of the text instances in PDF document pages. HiQPdf Library allows you to extract the images from PDF documents to memory objects or to image files in a folder. You can choose the range of PDF pages from where to extract the images. HiQPdf Library allows you to rasterize PDF pages to image objects in memory or to image files in a folder. You can choose the color space of resulted images, the resolution of the rasterization and the range of PDF pages to rasterize. You have also the option to convert the PDF document to a multipage TIFF image. HiQPdf Library allows you to print PDF documents silently to a printer, without print dialogs and without using any external program. You can choose the paper size, orientation and margins and the range of PDF pages to print. HiQPdf Library allows you to convert PDF document pages to HTML documents in a memory buffer or to HTML files on disk. You can choose the zoom level and the resolution or to create an index file when converting to HTML files on disk. float pdfPageWidth = htmlToPdfDocument.PageOrientation == PdfPageOrientation.Portrait ?